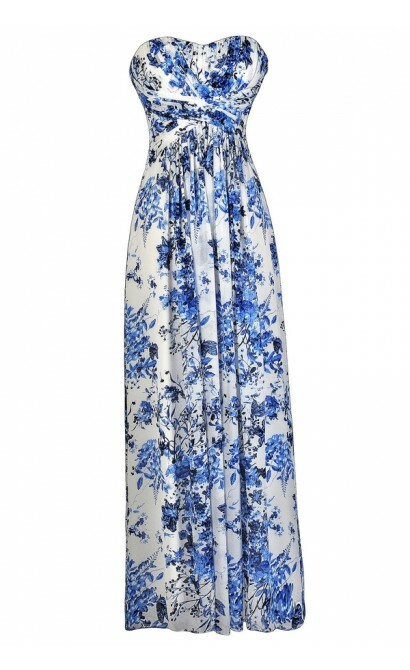 The gorgeous blue and ivory floral print of this maxi dress reminds us of antique porcelain. The Heirloom Porcelain Blue and Ivory Floral Print Maxi Dress is fully lined and maxi of chiffon. It has an ivory background with a bold blue floral print throughout. This dress features a strapless sweetheart neckline, lightly padded bust, and a full length maxi cut with a slight train the back. We love the chiffon pleating at the bust as well as the fabric that crisscrosses at the empire waist, forming and X. A hidden back zipper completes this dress. The Heirloom Porcelain Blue and Ivory Floral Print Maxi Dress is the perfect dress to wear to any upcoming formal event. 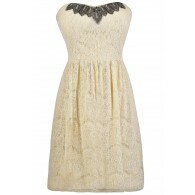 We absolutely love this dress and think it would even work as a unique bridesmaid dress. Details: Fully lined. Lightly padded bust. Hidden back zipper. 100% polyester. Lining: 95% polyester, 5% spandex. Dry clean only. Small measurements: Length from top of bust to hemline: 52-61". Bust: 32". 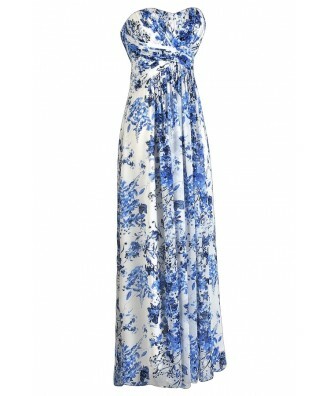 You have added Heirloom Porcelain Blue and Ivory Floral Print Maxi Dress into Wishlist. You have added Heirloom Porcelain Blue and Ivory Floral Print Maxi Dress for Stock Notification. 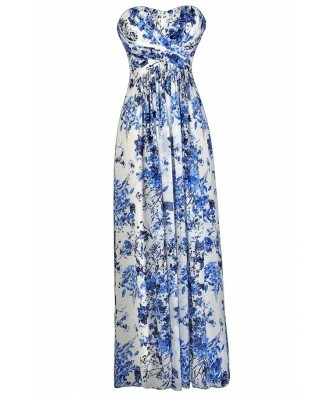 You have set Heirloom Porcelain Blue and Ivory Floral Print Maxi Dress as a loved product. 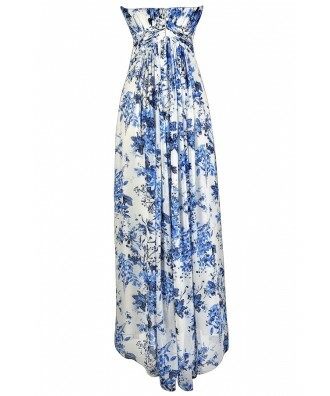 You have removed Heirloom Porcelain Blue and Ivory Floral Print Maxi Dress as a loved product.